The International Monetary Fund has agreed a $14-18 billion two-year bailout for Ukraine, a deal to help it recover from months of turmoil that will also unlock further credits making a total of $27 billion. The agreement, announced on Thursday, is intended to help the heavily-indebted ex-Soviet republic stabilise its economy after anti-government protests which resulted in the overthrow of President Viktor Yanukovich and a standoff with Moscow in which Russia annexed the Crimea region. But the programme of reforms that accompanies the support and which the IMF says is necessary to get economy back on track and avoid a debt default may be painful for the population and the new government at a time of crisis and uncertainty. "The mission has reached a staff-level agreement with the authorities of Ukraine on an economic reform programme," the IMF said in a statement. "The financial support from the broader international community that the programme will unlock amounts to $27 billion over the next two years. Of this, assistance from the IMF will range between $14-18 billion, with the precise amount to be determined once all bilateral and multilateral support is accounted for." Ukraine's debt insurance costs fell sharply after the deal was announced, hitting two-month lows in the five-year credit default swap market. The Ukrainian parliament has to sign off on the conditions in the package. It is expected to vote on it later on Thursday. The agreement is also subject to approval by IMF Management and the Executive Board, which will consider it in April. Conditions sought by the Fund include allowing the national currency, the hryvnia, to float more freely against the dollar, increasing the price of gas for the domestic consumer, overhauling finances in the energy sector and following a more stringent fiscal policy. IMF mission chief Nikolay Gueorguiev outlining the proposed package said another important step was to pass a law on public procurement aimed at restraining corruption in the state sector and reducing state budget expenditure. 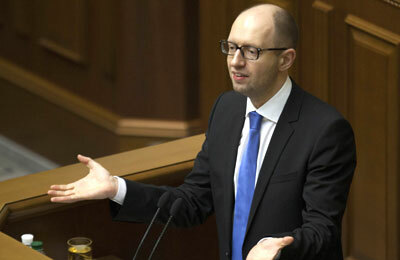 Prime Minister Arseny Yatseniuk, who has dubbed his government a 'suicide' government because of the unpopular measures it will have to take to right the corruption-ridden economy after years of mismanagement, urged parliament to approve the measures outlined in the package. "Ukraine is on the edge of economic and financial bankruptcy," he said, warning that the price Ukraine will pay for Russian gas supplies was expected to rise by nearly 80 percent from April to $480 per 1,000 cubic metres. He said inflation in 2014 would be between 12 and 14 percent and unless laws were passed to support the austerity measures proposed by the IMF to stabilise the economy, GDP could fall 10 percent during the year and Ukraine could default. The previous, ousted government said the country of 46 million needed around $35 billion over two years to stave off bankruptcy. It faces about $10 billion in repayments on its foreign currency debt this year, excluding the several billion dollars it will require for gas imports from Russia. In June, it will have to pay out on a $1 billion eurobond that matures. In a move on Wednesday, seen as a gesture by Kiev to secure the IMF package, the government said it had agreed to raise the price of gas to the domestic consumer - a long-standing demand by the Fund - by more than 50 per cent from May 1. This was an unpopular condition for IMF aid that Yanukovich had refused before he was ousted last month. "Following the intense economic and political turbulence of recent months, Ukraine has achieved some stability, but faces difficult challenges," the IMF statement said. Announcing the agreement in the Ukrainian capital, Kiev, Gueorguiev declined to say how big the initial tranche of aid would be. Kiev has said it desperately needs cash to cover expenses and avert a possible debt default. The country's finance minister has predicted the economy will contract 3 percent this year.